Residential development site for up to 20 houses in desirable small village just 6 miles from Elgin and extending to approximately 1.42 hectares/3.50 acres. Architect designed property in beautiful rural situation. Constructed in 2008 to an exacting high standard and a huge internal foot print of almost 300 m and offering a versatile yet comprehensive floorplan in walk in condition. A feature of note are the incredible uninterrupted views regardless of the weather across the countryside towards, Lossiemouth, across the Moray Firth and beyond to the hills of Sutherland and the Black Isle. Externally Rose Brae House enjoys easily maintained garden grounds surrounded by Leylandii hedging providing both shelter and privacy, generous expanse of lawn and a large patio. “Behind the All American front porch the interior is grand, elegant and a eclectic fusion of styles”. Beautifully converted Steading with huge charm and character enjoying a quiet, picturesque semi rural situation yet close to Kinloss, famous Findhorn and Forres. 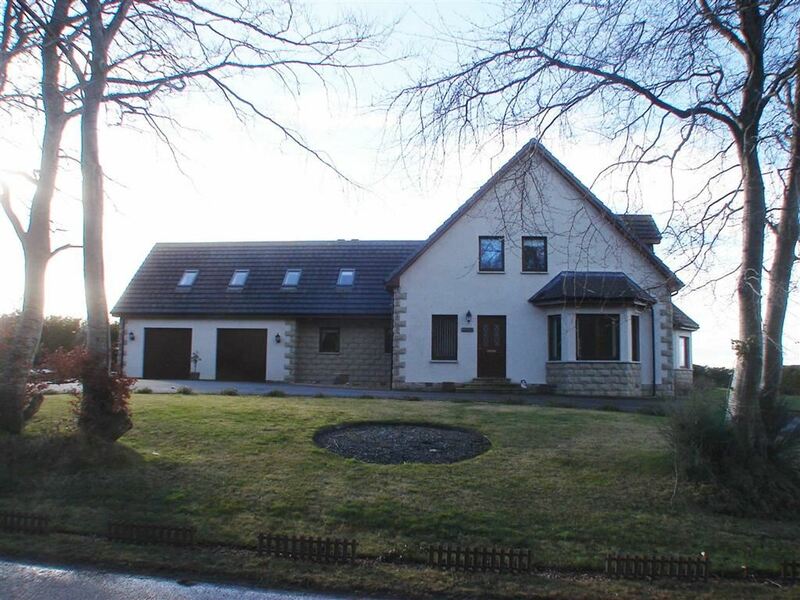 Fabulous architect designed, one and a half storey house in rural location yet only a short drive from both Lossiemouth and Elgin and all the amenities they have to offer. Constructed in 2013 to a high specification throughout, with bright, fresh and tasteful décor resulting in a most welcoming and comfortable property of which an internal viewing is highly recommended. Spacious accommodation comprises on the ground floor; a superb open plan living area incorporating Kitchen, Dining and a Lounge, Utility Room, Study, Master Bedroom with Ensuite Shower Room, Bedroom 2 and Family Bathroom. On the upper floor are 3 further Bedrooms and a Shower Room. The property further benefits from double glazing and oil fired under floor heating on the ground floor and radiators on the upper floor. Outside there is a low maintenance garden to the front and an enclosed garden to the rear with views across the countryside. Detached double garage. Summer house. Superb family home within the prestigious Bruceland Mansions development with a generous floor plan with of approx 182 sq m offering flexible living accommodation.over two floors comprising; entrance hallway, guest wc, lounge, family room, generous open-plan kitchen with dining area and utility room. Upper floor with feature gallery landing, master bedroom with en suite shower room, 3 further double bedrooms, study and family bathroom. Externally the property benefits from a generous attractive enclosed mature garden complete with several raised vegetable beds, large patio and attached double garage. Detached Ashley Bartlam Architect designed house of distinctive style and quality constructed in 1952 and enjoying a lovely elevated situation in one of the more desirable areas of West End of Elgin. Spacious 4 bed bungalow set in secluded, idyllic rural setting with established gardens of approx. 1.2 acres and affording complete privacy yet within easy commuting distance of Inverness and ideally placed for the airport. Included in the sale is an additional strip of land extending to 1.1 acres which lies adjacent to the West of the property. Superb detached house offering comprehensive and versatile accommodation in excellent order having been significantly upgraded by the current owners. Enjoying a highly convenient situation within Lossiemouth, tucked away on Ramsay Lane and perfectly placed for the shops and East Beach. Substantial detached family house, with spacious south-facing garden, situated in a quiet cul-de-sac in the highly desirable west end of Elgin. Accommodation comprises:- Lounge, Dining Room, Kitchen and Shower Room on the Lower Floor, and 4 Bedrooms, Study and Family Bathroom on the Upper Floor. Passageway leads from the house to the Store Room, Workshop and single Garage, with a multi-purpose Games Room above. This well-maintained property benefits from gas central heating, double glazed windows to the front and side of the property, and single glazed windows to the rear. Kilrymont is complemented by generous secluded garden grounds extending to approximately 1/3 of an acre. It is in the catchment area for both West End Primary School and Elgin Academy. Traditional meets contemporary in this amazing refurb project and they come together with style, subtle sophistication, sleek lines and superb light – all in parallel with continuous and uncompromising high quality and attention to detail.